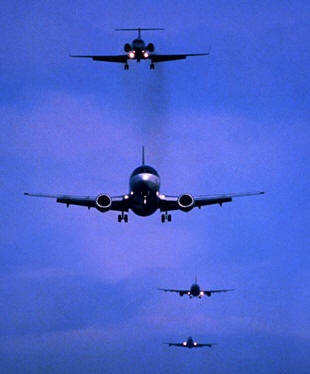 April 23, 2013 - As a result of employee furloughs due to sequestration, the FAA is implementing traffic management initiatives at airports and facilities around the country. Travelers can expect to see a wide range of delays that will change throughout the day depending on staffing and weather-related issues. For example, the FAA is experiencing staffing challenges at the New York and Los Angeles En Route Centers and at the Dallas-Ft. Worth and Las Vegas TRACONs. Controllers will space planes farther apart so they can manage traffic with current staff, which will lead to delays at airports including DFW, Las Vegas and LAX. The FAA also expects delays at Newark and LaGuardia because of weather and winds. The FAA will continue to work with the airlines throughout the day to try and minimize delays for travelers. The FAA encourages travelers to check their flight status and also to visit fly.faa.gov for the latest airport delay information. Yesterday more than 1,200 delays in the system were attributable to staffing reductions resulting from the furlough. There were more than 1,400 additional delays as a result of weather and other factors. Sequester or sequestration refers to budget cuts to particular categories of federal spending that began on March 1, 2013 as an austerity fiscal policy. The cuts were enacted by the Budget Control Act of 2011 and initially set to begin on January 1 but that date was postponed by two months by the American Taxpayer Relief Act of 2012. The spending reductions are approximately $85.4 billion during fiscal year 2013, with similar cuts for years 2014 through 2021. However, total federal outlays will continue to increase by an average of $238.6 billion per year during the next decade, although at a somewhat lesser rate because of the sequester. The cuts are split evenly (by dollar amounts) between the defense and non-defense categories. Some major programs like Social Security, Medicaid, federal pay (including military pay and pensions) and veterans' benefits are exempt. Medicare spending will be reduced by 2% per year versus the planned levels. The Congressional Budget Office estimates that the sequester would reduce 2013 economic growth by about 0.6 percentage points (from 2.0% to 1.4%) and affect the creation or retention of about 750,000 jobs by year-end. Over the 2014–2023 period, the sequester would reduce planned spending outlays by $995 billion with interest savings of $228 billion or a total of over $1.2 trillion in debt reduction. The blunt nature of the cuts has been criticized with some favoring more tailored cuts and others arguing for postponement while the economy improves. With the recent announcement from the Federal Aviation Administration (FAA) regarding the furlough of employees resulting from the sequestration battle, there has been much speculation over the effects this decision would have on the National Airspace System and the individuals who serve or are served by it. The Coalition of Airline Pilots Associations (CAPA), a trade association representing over 22,000 professional airline pilots, has been actively meeting with air traffic controllers and other officials across the country to provide their membership with a greater understanding of this issue. A travel experience consisting of extensive delays and cancellations will have far-reaching effects on an industry that today is still trying to recover from an era of bankruptcies, job losses, and reduced services for our passengers. Sadly, legislative gamesmanship and the choices foisted upon governmental agencies will result in understaffed facilities and delays, causing disruption and needless difficulties for the traveling public. CAPA, along with other trade and labor associations, joins the nation’s airlines in calling for a quick solution to this untenable forecast of increased delays. Furthermore, CAPA believes that a collaborative approach, which provides Congress with stakeholder input, is crucial in maintaining the standard that the traveling public expects, the travel industry deserves, and our members demand. The National Air Traffic Controllers Association (NATCA) stated “after just two days of furloughs for air traffic controllers, more than 10,000 flights have been delayed and more than 600 canceled. This is just the beginning of what promises to be a huge economic disruption if the furloughs are not stopped. As bad as delays have been, they could be even worse if the FAA were not taking extraordinary steps to cover for the controllers forced off the job. “The FAA has been forced to cancel all training, halt work on critical modernization and NextGen projects, and are even using overtime at some of the busiest facilities. This last decision is particularly concerning because the use of overtime pay is actually costing the FAA money, eliminating any savings that are supposedly being achieved for sequestration. It’s simple math - furloughing controllers earning base while paying others base pay plus an additional 50 percent will not result in savings. “This is no way to run the world’s safest, most efficient national airspace system. Controllers continue to do their best every day to keep the system running. It’s time policymakers show the same amount of effort and dedication. A bipartisan solution to stop these furloughs must be reached and soon, in order to keep controllers on the job full time and America’s national airspace operating at full capacity”.